Welcome to Romaldkirk self catering holiday cottages. 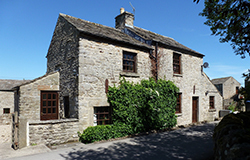 Our family run cottages sleep between 2 and 32 guests in one of England's most picturesque areas - an ideal get away. Our three detached cottages set on our farm on the edge of the picture-perfect village of Romaldkirk, it's the ideal place for a full-sized family gathering; walking or cycling groups; reunions of friends; team away weeks or weekends. It is also equally ideal as an intimate getaway for just two; or a family of 4 or 5. Whether you are looking to escape for a week or more, or whether you are looking for a short weekend or mid-week break, we can help. All the cottages have ample private off road parking. The cottages are ASHWOOD LODGE which sleeps 17 (14 plus 3 children), BIDE-A-WEE which sleeps 6 (4 plus 2 children) and recently available SUNRISE BARN which sleeps 9. SUNRISE BARN is our latest conversion. 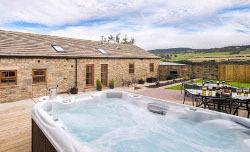 Originally a milking parlour, it is now a luxurious 4 bedroom cottage with its own private luxury hot tub. The deluxe cottage is all ensuite with a spacious, full height ceiling, kitchen diner and a separate lounge with a real log fire. The back door leads to a beautifully landscaped, private garden suitable for both childrn and dogs. The outside area has ample furniture and a gas barbecue. The barn sleeps 9 adults. Well behaved dogs are welcome. With footpaths leading straight from the cottages it makes an ideal spot for pets. Being in the middle of one of the most beautiful, yet undiscovered corners of the country means you can explore the area, enjoying all of the attractions, activities, pubs, markets and stunning scenery without the bother of traffic jams and town centres bursting at the seams with thousands of other tourists. For more details of what is on offer when you visit Teesdale, go to our WHAT TO SEE AND DO page. You can also visit the THIS IS DURHAM page for more information. We love it here. We hope you will too! Join us on FACEBOOK, where you can see many more photographs of the local area.